Derek Smith and Shannon Holt in FRED. Photo by Daniel Jaffe. BOTTOM LINE: A robot, his mother, and a Carpenters tribute band, orbiting Pluto. Welcome to the Clam, a senior home on a space station. It has a view of Charon and is in orbit around Pluto. It also has an ever-shrinking population, but thanks to the arrival of FRED (Derek Smith) the robot and his mother Diana (Shannon Holt), the Clam now accommodates four residents instead of three. Budget cuts have resulted in fewer activities and entertainment options at the Clam; the lunch announcements are outdated; and power shortages are part of the daily routine. All things considered, the Clam doesn't seem to be much of a haven at all. Introducing FRED, a robot originally designed by his creator, the late Fred Sr., as a pool vacuum. Fred Sr. has been dead for 200 years, and his widow, Diana, who's been in a medically-induced coma for the past 198 years, is under FRED's care. The unlikely pair, connected with a vacuum tube which FRED uses to keep Diana alive, is originally from Phoenix, AZ. FRED figures it's time for a change after 200 years of lonesome with his comatose "mother," so he takes a leap of faith and ends up in possibly the most depressing nursing home in the universe. The daily entertainment is provided by the Kunzigs, an intergalactic Carpenters tribute band (Patrick Harvey, Rebeca Miller, and Michelle Uranowitz). The siblings have been performing before an unresponsive audience until a not even particularly enthusiastic "Yesterday Once More" rouses Diana from her coma. Diana's awakening sets the play in motion as the ancient woman tries to recall her past, and finds her way amidst unfamiliar surroundings. 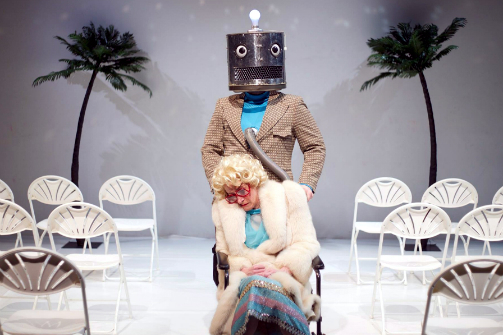 Playwrights and designers Christopher Ford and Dakota Rose (Rose also directs) have created a charming artificial '70s oasis to be the aesthetic of the senior center, down to the white sterile floor and symmetrical palm trees. The costumes fit perfectly into the world as well, especially with the performers' bright-colored bell bottoms, Diana's bedazzled frocks, and FRED's tin head with a lightbulb atop it. Smith's FRED is the focal point and highlight of the production, as the performer delivers FRED's extensive range of emotions even with his face completely covered. The comical style of the show makes you channel fond memories of The Jetsons. Transitions between scenes are filled with explosive dance movements to España cañí and other pasodobles, delightfully exaggerated in Chloe Kernaghan's stylized choreography. FRED is seventy-five minutes of non-stop exuberant day dreams that turns out to be quite moving, as the robot continues the dance of stubborn vitality. It almost seems like Diana's humanity has passed over to FRED through the vacuum tube, and eventually lives on through the increasingly intelligent, and even more empathetic robot. FRED is by Christopher Ford and Dakota Rose. Directed by Dakota Rose. Choreography is by Chloe Kernaghan. Music Direction and Arrangements are by Andrew R. Butler. Set, Costume, and Sound Design are by Christopher Ford and Dakota Rose. Lighting Design is by Chantel Gaidica. The cast is Andrew R. Butler, Patrick Harvey, Shannon Holt, Rebeca Miller, Derek Smith, and Michelle Uranowitz.